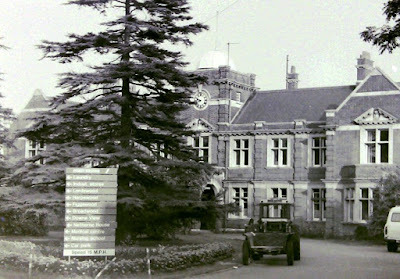 Netherne Hospital opened its doors on the 1st April 1909. Prior to 1840 patients from Surrey either got sent to Bethlem or a private asylum. In 1840 Wandsworth Asylum was built to accommodate Surrey patients; a second asylum was built at Brookwood, and a third at Cane Hill, but when London expanded to take over a large area of Surrey south of the River Thames, Cane Hill was used for London residents. Then as Brookwood filled up and was no longer large enough for Surrey it was decided to erect a new asylum at Netherne on a farming estate on a hill two miles from Coulsdon. The direct path to the Asylum was quite steep and crossed high above a railway cutting, and so a zig zig road was constructed up the hill for vehicles. Netherne was initially designed for 960 patients, but with plenty of room to grow. The main building itself was in the shape of a south facing arc so that all the wards could get the sun during the day. It was unlike previous Victorian custodial style asylums, and built of pale red brick and portland stone on two levels. There were villas separate from the main hospital to give some chronic patients - who worked on the land, and convalescent patients - ready to be discharged, a less institutional type of place to live. There was also a chapel, admin block, recreation hall, accommodation for nurses, and a cemetery. The whole estate was about 350 acres, and employed patients on a farm which included cows for milk, and a piggery with about 120 pigs to consume the food waste. Thanks to the Surrey Mirror of 9th April 1909 on the British Newspaper Archive for some of the details. The picture above is one I took in 1977 of the admin area and a board with directions.The hospital was wound down and closed in 1994, but quite a lot of the buildings retained for the new village of Netherne on the Hill..